THIS IS NOT TRADITIONAL Rivetted STEEL. THIS IS seamless one-piece STEEL. Like cast iron, formed iron/steel has been well-known among experts for centuries. The famous French thick steel chef pans are used in all the best restaurants of the Western world because they heat so evenly, brown foods as well as cast iron, and for their ability to build a healthy, natural nonstick surface through seasoning. Chefs destroy synthetic coated pans within months. Formed-iron/steel cooks much the same as cast iron, but with less weight, so thus more manageable for chefs to swing around for long periods. The engineers at SOLIDTEKNICS have always loved cooking with French steel pans, but wanted to find a way to finally eliminate the rivets holding the traditional skinny strip steel handles, and make a more comfortable and cooler handle for chefs. And make them 100% in Australia from clean Australian steel, and make them competitively. There are no other production seamless one-piece steel chef pans. Nobody thought it was possible. Now the results speak for themselves. All SOLIDITEKNICS cookware is compatible with all rangetop heat sources (being solid iron/steel, they are perfect for induction), safe for glass tops (seasoned iron is much softer than enamelled iron), oven-proof, and tough enough to take camping and use over open fire pits or in high-temp wood-fired ovens. 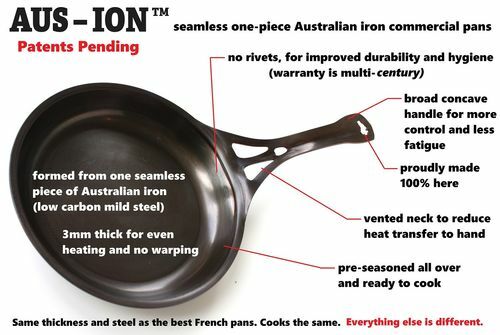 SOLIDTEKNICS pans are so tough, they come with a multi-century warranty, for multi-generation sustainability.